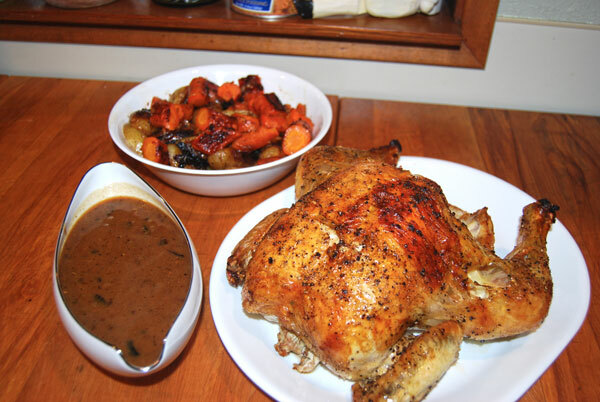 Gravy used to be such a mystery for me….sometimes it would turn out, sometimes it wouldn’t (yes – LUMPS). There is one simple trick that I learned – equal parts fat to flour. That’s IT. Why did it take me years to figure that out ? Our Christmas Dinner was as simple as it gets. I prepped the veggies and chicken in advance (recipe here: https://locarbjabberwockey.wordpress.com/?s=christmas ) and just put the entire roasting pan in the fridge. After all, we REALLY needed to see “The Desolation of Smaug” and wouldn’t be getting back home until about 5:30 pm. The instant I walked in the door, I turned on the oven and popped the chicken/veggies in for about an hour and 15 minutes. I removed the veggies and chicken and put the pan directly on the stove (medium heat). 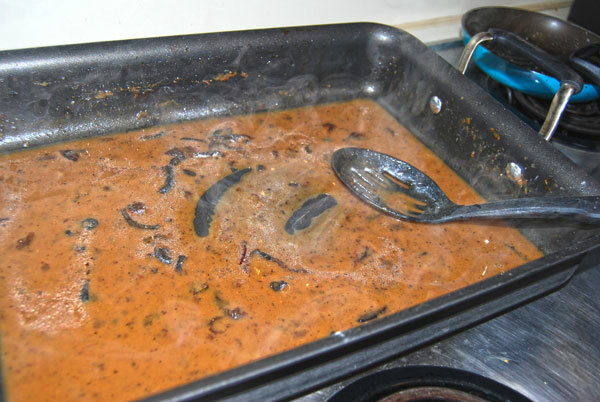 Leave all those burnt bits in there – they help create a super rich, dark gravy! 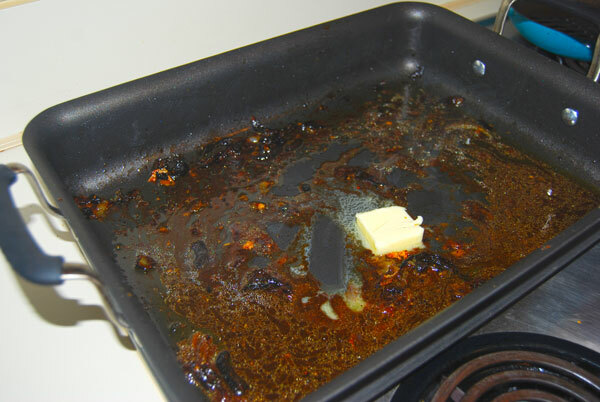 There was about 1 tablespoon of chicken fat in the pan, so I added 1 tablespoon of butter. Since I had 2 tablespoons of fat, I added 2 tablespoons of flour, stirred it in, and let it cook for about two minutes. Now it’s just a matter of adding in some chicken broth (today it was from a can). Moderation is what’s important here… I first poured in half a can and stirred until combined. It immediately thickened, and I gradually added another can of broth. But remember ! Don’t pour with too heavy a hand – it’s always easier to add more than to re-thicken it ! 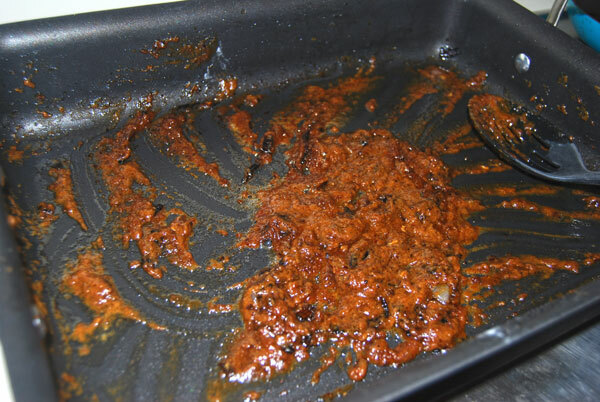 Each time you add more liquid, allow it to cook for a minute or two to see if it will thicken any more. Once the gravy is thickened, give it a taste. I did not need to add ANY seasonings. There was enough residual salt from the canned broth,butter and drippings and it was PERFECT. Melt butter with chicken drippings over medium heat. Add flour, and stir for about 2 minutes. Gradually add the broth until gravy thickens. You may need less (or more!) broth depending on how thick you like the gravy. we are ridiculous gravy lovers in my family! ! Love this. I’ve been making it for 40 years but telling someone else how is not my forte. I’m one of those nonmeasuring timing types. So I really appreciate you posting this! yay….I can just share this! ! Thanks so much ! I just used to struggle so much, but doing it this way, it turns out 100% of the time. I’m so serious that I consider it a crime and a sin to throw away drippings!!! You are SO right Dawnspitfire…I actually keep a bag of chicken bones, skin, parts, and veggie scraps in the freezer until I have enough to make broth. If I cook chicken and don’t make gravy, I dump the cooled drippings into the bag to flavor the future broth. Thanks whatthemom! 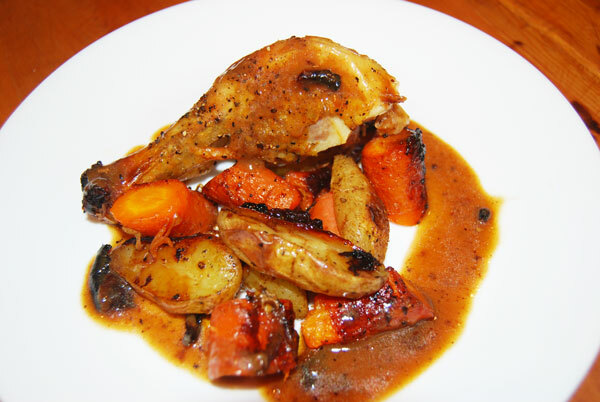 If you have some chicken on hand, roasting is SO easy !